Mfr. 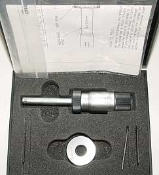 : Starrett , Model: 78MZ-12.5 , Range: 10-12.5mm , Condition: Excellent -New? , With 3 point carbide contacts and setting ring. As good as they get, Don't Miss Out!